The cockpit announcement as the plane bumped through the air towards Hong Kong was a masterpiece of understatement: “Ladies and gentlemen, this is the captain speaking. As you no doubt may be aware, we have a small problem with our engines …” Minutes earlier, the pilot who spoke those calm but ominous words, Malcolm Waters, then 35 years old, had been struggling alongside First Officer David Hayhoe to prevent the crippled Cathay Pacific aircraft from plunging into the South China Sea. Filled with contaminated fuel before take-off in Surabaya, the Airbus A330-342, with 322 passengers and crew aboard, had been gliding ever closer to the sea with no power in either engine – and even when the pilot made his announcement, its fate was still far from certain. In an extraordinary sequence of events, the plane’s two Rolls-Royce engines spluttered and failed in the final descent to Hong Kong, leaving the captain and co-pilot with an unprecedented challenge. For three to four minutes, the plane headed helplessly towards the choppy ocean below before the pilots managed to regain thrust in one engine to keep Flight 780 aloft. Then, in their final approach, the power setting jammed in the one functioning engine, forcing the pilots to land the plane at a dangerously high speed of 231 knots, some 177km/h above the normal landing speed. The remarkable actions of Waters and Hayhoe were last month recognised when they were awarded the prestigious Polaris Award for heroism and airmanship by the International Federation of Airline Pilots’ Associations. Now, in their first newspaper interview since the drama four years ago, the two Australian pilots describe to Post Magazine how the emergency unfolded and the fear they felt as they battled to prevent a catastrophe. 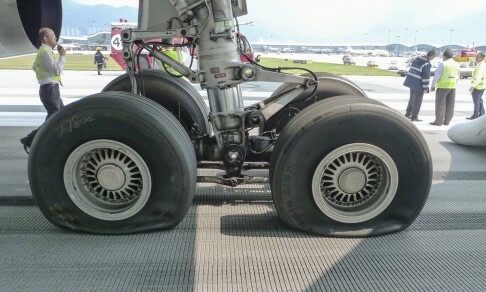 Flight 780’s deflated tyres after the high-speed landing in 2010. IT WAS A BRIGHT spring afternoon over the South China Sea, about 50 nautical miles from Hong Kong, when what began as a problematic but manageable flight from Surabaya turned into a life-or-death emergency. There had been some fluctuations, or misfirings, in both engines – particularly in engine No 2 (that to the pilots’ left) – as the plane climbed out of Indonesia’s second-largest city on the morning of April 13, 2010. Two hours into the flight, there were more fluctuations in engine No 2. On both occasions, the pilots radioed Cathay Pacific engineers in Hong Kong, who advised them it was safe to continue the flight as all the other vital signs from the engines appeared normal. The A330 is designed to fly comfortably on one engine and there was no inkling yet of the chaos the contaminated fuel would cause. But some 110 nautical miles short of Hong Kong, the situation worsened. The pilots received a message from the onboard computer saying engine No 2 had stalled. They set engine No 1 to maximum thrust and requested a priority landing. Then, as the plane flew at 8,000 feet some 45 nautical miles southeast of Hong Kong, a stall message was received for engine No 1 – meaning that while the engines were still ticking over, neither was producing any thrust. A year earlier, US Airways pilot Chesley Sullenberger had made world headlines by landing a passenger plane safely on the flat waters of the Hudson River in New York after a double bird strike shortly after take-off. “I looked out of the window and I looked at the state of the sea and I thought, ‘That’s not the Hudson’,” says Waters, of the choppy conditions below. The aircraft was already too low to glide to the airport. “There are procedures for losing all engines at high altitude and we had practised that, but in our case … the engines were not working very late in the game, only 15 minutes from landing,” says Waters. “We were at 8,000 metres. We weren’t at 40,000 feet with 40 minutes of gliding time. The plane sank from 8,000 to 5,000 feet in three or four minutes of gliding. “Initially, I couldn’t believe what was happening,” Waters says. “Then you realise what the issue is. Then the realisation of what could happen strikes you and, I suppose, what you feel is fear. 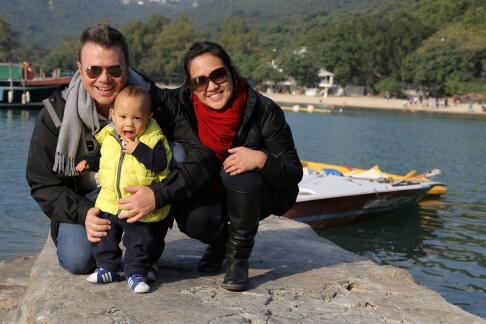 Co-pilot Hayhoe, a 41-year-old father-of-two from Sydney, says, “I felt a sense of disbelief. I spent a long time in the military undertaking much more adventurous flights. I certainly didn’t think that by coming to an airline anything like this would present itself. “I couldn’t believe I had been in the military all those years and now I was going to put an airliner in the water. “Then I started thinking, ‘Well, we’ve got to do something about it. How do we dig ourselves out of this situation? How do we not hit the water and, if we do hit the water, how do we do it properly, to give us the best chance of getting the best result?’” Waters took the plane off automatic pilot as the two pilots declared a Mayday. “I found comfort in the fact that I had something to do. You put one foot in front of another and once you do that you are in a place you’ve been before,” says Waters. The passengers being evacuated via emergency inflatable slides. “You think, ‘We are going to do this, then try that, then talk to this person’. The startle factor starts to recede a bit and you start to feel you have some control. Things seemed to flow more. With no precedent and no clue as to what was causing the problem, all Waters could do was slowly move the position of the thrust levers in the hope power would somehow return to engine No 1. Although neither pilot knew why or how, gradually power returned. “The thrust would come up a little bit and stabilise,” says Waters. “And so I pushed the lever just another few millimetres and initially nothing would happen but slowly over seconds it would come and you would get more. JUST AS THE WORST appeared to be over, along came a second crisis. As the plane came in to land, Waters shut off the levers but found engine No 1 was jammed at about 70 per cent of total power. “I quickly realised this was turning into another very serious situation – the same sort of feeling came like I’d had earlier, with the possibility of ditching,” he says. “We had to figure out how to get down to the runway from this altitude when we were this close and at this speed with an engine stuck on high thrust. “At that point, we started getting a lot of warnings going off in the cockpit, too. The cockpit started to become a very noisy place. All the systems are built into the airplane to warn you you’re approaching a dangerous area … the warnings were coming so thick and fast they were going over the top of each other. The plane came in fast. On first contact, the plane glanced back up into the air, rolling steeply to the left. “I remember thinking, ‘This is it’,” says Waters. “Thankfully, the roll stopped and the airplane responded and I could fly it down again for a second try. “I got the airplane back under control and the second touchdown was much better. Even so, I didn’t think we would stop in time. We were so far outside the envelope. When you look at what landing distances you require it was off the scale. The plane stopped some 309 metres short of the end of the runway. Hayhoe says, “I remember thinking, ‘How the hell did that just happen? Obviously, we are now on the ground. How did we get in this situation?’ We still had no idea what had gone on. The adrenalin was pouring through my body. “Then we were faced with the next situation, which was the brakes. The pilots watched as the brake temperature soared to more than 1,000 degrees Celsius as the plane sat on the ground. That raised the possibility of the tyres exploding and rupturing the fuel tanks in the wings directly above the wheels. He took the decision to evacuate the aircraft using inflatable slides. Fifty-seven passengers and six cabin-crew members received minor injuries during the evacuation process, the most serious of which was a broken ankle, received by an elderly woman. Waters and Hayhoe were the last to leave the plane. “When I came off the slide, I turned around and looked at the airplane and it was like a Hollywood movie,” Waters says. “There was an airplane with pieces hanging off it. All the slides were deployed. The life packs and the food packs and everything that goes with the life rafts were hanging off strings from the door slide. “They were swaying in the breeze, there was a lot of smoke and steam from the fire department putting the fires out on the wheels and paramedics, fire trucks and police driving around and people at the bottom of the slides being helped away. “I couldn’t believe we had got away with it. There was a very good chance we weren’t going to be walking away that day. There was a lot of joy that we were going to go home to our families. “An American businessman who had been on board found me walking around the side of the runway and he came over to me and said, ‘Are you the captain?’ He just was shaking my hand and saying, ‘Thank you so much’. “It’s a strange feeling because while most of this process is going on, you are – to some degree – in control of what’s going on,” says Hayhoe. “Once you step outside the airplane, you are handing over that control to a sequence of events, to the investigation, and to the people looking after you. But I do remember thinking, ‘Fifteen minutes ago I would have given anything to be standing on the ground’. The investigation that followed found the incident had been caused by contaminated fuel uploaded at Surabaya. A series of changes in the way refuelling is monitored and controlled have since been implemented to prevent such an event happening again. 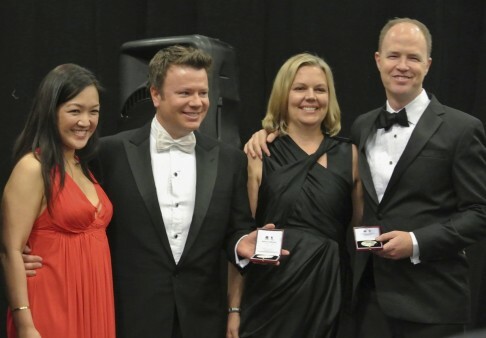 Waters, with wife Sandra, and Hayhoe, with wife Jane, pose with their Polaris awards last month. Surprisingly, the actions of Waters and Hayhoe received relatively little attention until the awarding of the Polaris this year. Darryl Soligo, president of the Hong Kong Airline Pilots Association, which nominated Waters and Hayhoe for civil aviation’s highest honour, says, “What really makes [the Polaris Award] so special is that it’s awarded by the piloting fraternity itself. “We have all heard of Captain Chesley ‘Sully’ Sullenberger and the Miracle on the Hudson. These pilots, however, displayed equally incredible airmanship, but they have gone largely unnoticed simply because of the successful outcome of the incident. Chris Kempis, chief pilot (Airbus) with Cathay Pacific, adds: “The most important thing to bear in mind is this is not a scripted or pre-trained event. We train for the events we consider the most likely and this was far from it. Most of us who are professional pilots hope we would behave in the same way. We don’t know for sure, but we hope we would meet the same standards. These guys have certainly proved there is a benchmark out there that is outstanding. For Waters and Hayhoe, the greatest testament to their actions are the lives still being lived today. One year after the incident, a Dutch couple who were on board the flight sent a letter to them simply thanking them for giving them the chance to carry on living their lives. “I think about all the people running around the airport that day,” says Waters. “All those kids on board can grow up and have kids of their own. The life-or-death drama on board Flight 780 from Surabaya to Hong Kong was caused by contaminated fuel, which gradually impaired the two engines, ruled a Civil Aviation Department investigation into the incident. Neither the pilots nor the Cathay Pacific engineers were aware of the fuel contamination before or during the flight and, until the engines began to fail, there had been nothing to indicate there was a problem. Investigations found the 24,400kg of aviation fuel uploaded at Surabaya was contaminated with salt water, which caused engine pressure fluctuations and later near-catastrophic engine failure. The salt water damaged filter monitors, which meant the pilots were unable to shut down the one functioning engine when the plane came in to land, forcing them to execute a high-speed landing. A series of steps have since been taken to improve the monitoring of the aircraft refuelling processes. Facilities in Surabaya have been upgraded and audited and refresher training courses held for refuelling staff; the International Civil Aviation Organisation has issued checklists; and Airbus has issued guidelines to pilots worldwide on how to handle such a crisis. Two years after the accident, Cathay Pacific began legal action seeking unspecified damages from the supplier, Miami-based World Fuel, for pumping tainted fuel into the aircraft and a second Cathay Pacific plane, which had suffered less severe engine fluctuations after refuelling in Surabaya a day earlier.